Colin Youngson compiled the following profile of Eddie Stewart, a runner for whom all of Scottish athletics have a great respect. Were there an award for the most consistent high-level runner on a year-round basis, Eddie would have been at the very top, or near the top, over many years. 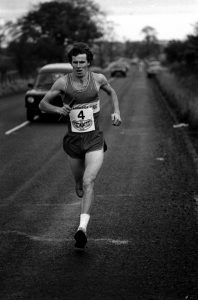 A Scottish internationalist several times over he was a member of a really great bunch of Cambnuslang Harriers runners. You can read some more about Eddie at this link. How did you get involved with the sport? At the age of fourteen I started running at school, where they had a cross country club. The head music teacher, Bill Wright, was a keen runner and a member of Paisley Harriers. Like most boys I played a lot of football, not very well but I used to run all over the pitch chasing the ball, which annoyed the other lads but I did win my first medal in football when our primary school team won the local school league. So I liked running and, when I realised I would never be much of a football player, it seemed natural to take up running as a sport. Probably the first person was Bill Wright who took the running club at school. We used to train on Tuesday and Thursday after school and on a Saturday morning if we didn’t have a race. We had 5 or 6 different routes of different lengths, ranging from 1mile to nearly 10miles. Most of the runs were like races and were all timed, so we could see how fast or slow we had run compared to the previous run over that route. Looking back, it wasn’t the most sophisticated type of training and probably coaches nowadays wouldn’t train young boys that way, but we enjoyed it, and it gave us plenty incentive to beat our own times or the times of the other lads. After I left school I joined West of Scotland Harriers but then I went to work for the Ordnance Survey in Southampton, where I half-heartedly trained and ran a few races for Southampton and Eastleigh. After 3 years I left the OS and came back to Glasgow. In the meantime West of Scotland Harriers had folded and I was thinking of joining Bellahouston when Robert Anderson arrived on the doorstep and asked if I wouldn’t like to join Cambuslang Harriers, since they had a young up-and-coming team. The bus connection between Mearns and Cambuslang wasn’t very good so Robert, being the enthusiast that he was and still is, used to pick me up on a Tuesday night and take me to the club and then take me back again after training. So I was inaugurated into the Cambuslang Tuesday night ‘Hampden Park’ training run”: 71/2 miles of hell. It always started out at a reasonable tempo with perhaps 20 runners in the group but it was never an easy run, with the likes of Alec Gilmour, Colin Donnelly, Rod Stone and later Jim Orr and Charlie Thompson to name just a few. There was always someone who was feeling good on the night who wanted to push the pace, and if the infamous Jimmy Quinn was there he used to stick the boot in after half a mile. The Tuesday night run was harder than a lot of races although we never admitted it, saying only that it ‘wasn’t bad’ or ‘felt okay’. So the whole squad of Cambuslang runners and officials had a big impact on my running – Robert, Dave Cooney, Des Yuill and Jim Scarborough who organised the club, along with all the runners who never made the first team, but who always kept the pressure on, waiting on a chance if we didn’t perform. None of us in the club were superstars – we were a bunch of lads with a bit of talent and a lot of hard grind, who made an impact on the cross country and road running scene in the 80’s and 90’s, but I doubt I would have had the same running success if it hadn’t been for the team spirit which the club had. I think, like most people who run, that the biggest thing is the feeling of being physically fit, of being able to get your training gear on and just run when and where you want, with no rules or regulations telling you that you must do this or that, and then the cameraderie of other runners. There is very little aggression in the sport because most of your energy is needed just to combat your own feelings of fatigue and tiredness and the battle is with your self. I suppose my best performances were in the Scottish cross country championships in 82 and 84 when I was selected for the Scottish team for the World Cross in Rome and New York – not that I ran very well when I got there, but I gave it a go. Most of my best performances were associated with Cambuslang winning team titles, notably when we won the Scottish cross country relay championships for the first time in Inverness. Clyde Valley AC was the favourite team and, expecting to win again had decorated the cup handles with red and white ribbons, but that didn’t bother us, as Cambuslang also run in red and white. Another first was winning the Scottish cross country team title at Irvine and then winning gold in the E to G relay which, although I never felt I ran very well in it, was always a great event , and it’s a pity it’s no longer in the race calendar. My worst performance I think was going down to the English Inter-Counties cross country and running like an absolute donkey – the legs didn’t work, the lungs didn’t work, and only the brain was working, telling me to stop. But I carried on and ended up near the rear of the field. Horrible. What unfulfilled ambitions have you? I don’t think I’ve any unfullfilled running ambitions – just to keep running and enjoying it. I like walking, painting and drawing and generally watching nature. The main thing running brought me is my wife, who I met at a race in Bolzano in Italy. 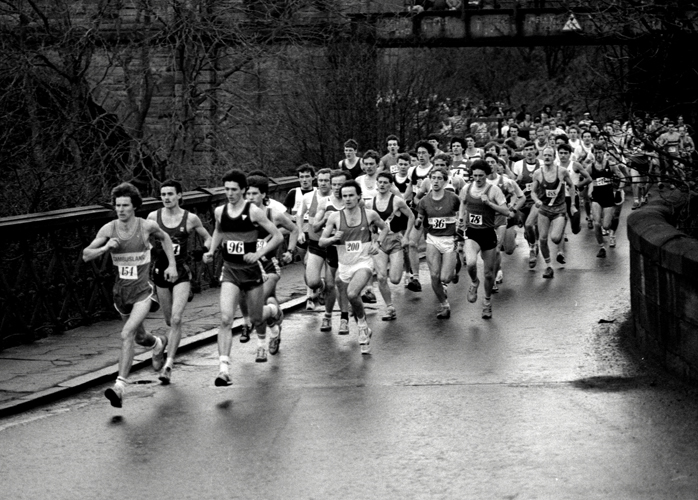 It was a New Year’s Eve race in 1987, and I was running in the Scottish team with Aidie Callan and Alastair Douglas. My wife-to-be was running for Czechoslovakia as it was then. We wrote letters to each other for about four years before I packed my bags,and I’ve been here in Prague ever since. In addition I’ve always liked the freedom and the feeling of being physically fit that running gives you. Also the friends I’ve made through the sport, both in Scotland and in the Czech Republic. I was never a big mileage man, due to my physical work as a gardener, but I always managed to get by with about 40 miles a week when I was running at my best. I always say that 8 hours gardening work is like steady circuit training – you’re using your whole body and not just your legs. so it gives you good general fitness. I never had a coach for running. For about 2 years I did train with Brian McAusland’s squad on a Wednesday night at Coatbridge, and Brian gave me a few ideas about how I might improve. Just training with that squad improved my general speed, not that I was ever known for my sprinting ability! My main running season was always September to March, usually with a break in April, and then some track and road running during the summer, but the cross country season was my main interest. A typical week’s training for me in the autumn would have been as follows. Wed. Track i.e. 12 x 400 in 69 secs with a diminishing recovery – 45 secs, 30 secs, 15 secs. I wasn’t fanatical about my training. If I felt I was tired I would take 2 or 3 days off to rest before starting again. I tended to do most of my training at a fairly good pace, even my longer runs, since I never felt comfortable running at a slower pace than I felt I had the energy for. During recent years, as a veteran, I try to get out 2 or 3 times a week, and this would include one longer run of say 9 or 10 miles, one interval session 8 x 500 on an undulating track in the woods, and a shorter 4 or 5 mile run on the country. I think that’s enough for me and it gives me a rest day or 2 in between my runs. (During a long and distinguished running career, Eddie Stewart, such a strong, consistent athlete, produced track bests of: 800m – 1.59; 1500m – 3.55.4; 3000m – 8.16.5; 5000m – 14.11.7; 10,000m – 29.55. On the road he ran a half marathon in 65.14; and, as an afterthought, a marathon – 2.23.47 (aged 39) and 2.26.59 (aged 40). In his favourite Scottish National cross country championships, Eddie was in winning Cambuslang teams an amazing 10 times, between 1988 and 2000. In the Scottish Masters cross country championships, he won the M40 title in 1998 (leading Cambuslang to team victory); M45 in 2004; M50 in 2007; M55 in 2012, 2015 and 2016; and M60 in 2017. The end for Eddie’s superb running is definitely not in sight!